Burn the Books, Bury the Scholars! Over the past four days, Cambridge University Press (CUP), a venerable academic publishing house that operates under the aegis of the even more venerable Cambridge University, has been the focus of international news reports. This has followed from the revelation that CUP had acceded to requests from the Beijing authorities to block readers in China from access to controversial articles about the People’s Republic published in China Quarterly, a leading journal on contemporary Chinese affairs. Chinese censorship has come a long way. During his rule in the second century BCE, the First Emperor 秦始皇 of a unified China, Ying Zheng 嬴政, famously quashed the intellectual diversity of his day by ‘burning the books and burying the scholars’ 焚書坑儒. He not only got rid of troublesome texts, he deleted their authors and potential readers as well. 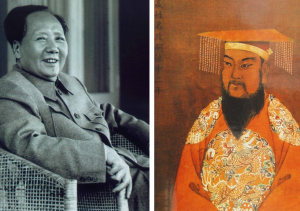 Mao Zedong and Ying Zheng, First Emperor of the Qin dynasty. As a senior academic working on China, and later as founding director of a major China research centre, I’ve sat through my fair share of meetings with academocrats obsessed with international rankings, income streams and their beloved business models. The report in today’s Guardian makes it clear: lofty principles aside, the bottom line is the only defensible line. CUP’s brand, although somewhat tarnished, has been salvaged. Is this what they call a ‘lose-win’ scenario? Having struggled to achieve the status quo ante one can well imagine that the boffins at Cambridge might even have the gall to congratulate themselves. Hélas, la perfide Albion! Not long after the death of Mao Zedong, a man known as the First Emperor #2, a new journal was founded in Beijing called Reading 讀書. The inaugural issue, which appeared in April 1979, featured an article by Li Honglin 李洪林. It was titled ‘There Are No Forbidden Zones for Readers’ 讀書無禁區. After thirty years of draconian Party censorship, this ushered in a new era in publishing, and reading. However, Li’s essay was published only days after Deng Xiaoping had attacked the threat of ‘Bourgeois Liberalism’ — i.e., free expression and democracy — and announced Four Cardinal Principles that affirmed the absolute authority of the Communist Party over Chinese life. Ever since then the country’s publishers, librarians, writers, book merchants and readers have played cat-and-mouse with a capricious system of censorship. 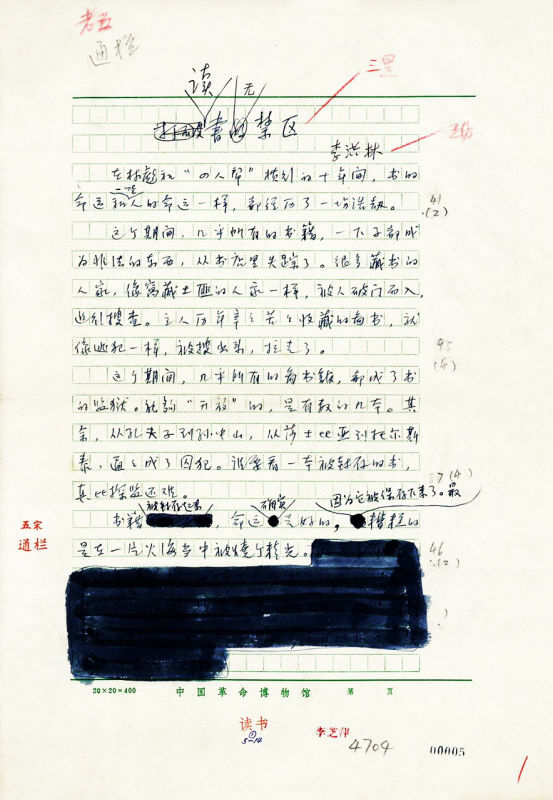 The first page of the manuscript of Li Honglin’s essay. During periods of relative laxity, all manner of work has been available in China, and generally readers with the requisite linguistic ability, and access, have been able relatively freely to read non-Chinese scholarship and works. There have even been surprises for Chinese-only readers: in the 1980s one old friend, the famous translator Dong Leshan 董樂山, was able to shepherd his translation of George Orwell’s 1984 passed the censors, and in 2015 the former Hungarian dissident Miklós Haraszti’s The Velvet Prison: artists under state socialism was published by the Central Compilation Bureau, an august body that also oversees the translation and dissemination of Marxist-Leninist classics. But, under the rule of China’s Chairman of Everything, Xi Jinping, a man who has more than a little of Mao about him, the noose has been tightening once more. No books have been burned yet (but who knows how many manuscripts have been relegated by the censors to data death on hard drives or to desk draws where they lie in wait for some future relaxation? ), although the imprisoned scholar Liu Xiaobo was recently subjected to murder-by-state-neglect. The Communist party-state of China plays a long game, the problem is it only allows its readers to bet on one side. As this delicious fiasco drew to a close, as if playing a cameo role in a Borgesian short story while still true to form, the censors in Beijing now censored the news that CUP had rejected their censorship. Bravissimo! * A shorter version of this essay was written for The Lowy Interpreter at the suggestion of Rory Metcalf. This longer version was reprinted by ChinaFile.